Less than a week removed from one of the most anticipated early-season snow events in recent Mid-South history and we're looking at yet another chance of the white stuff on Wednesday. The hype is definitely muted versus the last storm, and for good reason. Though the upper-level energy that this system will bring is impressive, the degree of moisture available is much less compared to last week's system and there is very little support near the surface in terms of dynamics. No big cold front, not even much of a hint of low pressure at the surface - this is strictly an upper level system. 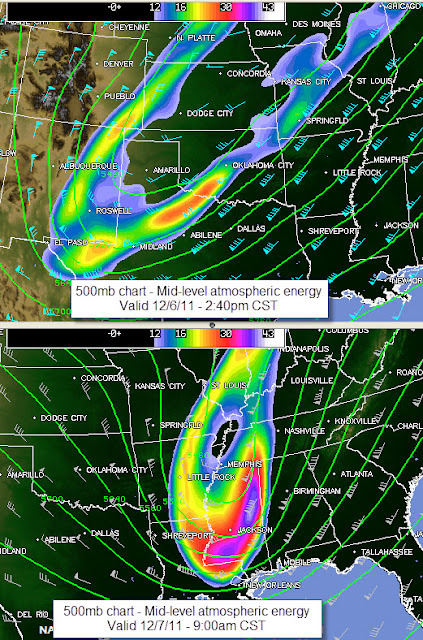 Taking a brief look at the wave in the upper levels (~18,000 feet) that will bring this shot of wintry precip, the graphics below show the position of the atmospheric energy (what we call "absolute vorticity" in the world of meteorology) as of mid-afternoon (top graphic) and at 9am Wednesday. The brighter colors equate to a stronger system, so you can see that it is strengthening and organizing as it approaches. Since the green lines don't completely form a circle in the lower graphic, it is not a "closed low," rather just a strong trough. The atmosphere will be most supportive of precipitation ahead of and under the upper trough, so we expect we could see some form of precipitation after midnight until mid to late morning Wednesday. 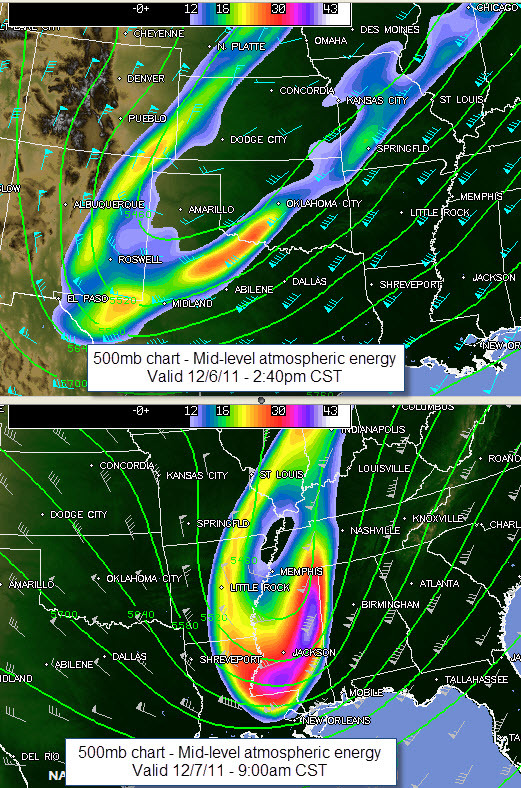 Low-level temperatures and moisture depth will define the precipitation type. Given the model data available (which all agrees fairly well), we expect to see some light snow after 1-3am, lasting through rush hour before tapering off after 10am as a rain/snow mix. Temperatures should remain at 33 or just above for the city and most suburbs during the event, though some outlying areas could see 31-32 degrees around and shortly after daybreak. Snow amounts will be minor, perhaps an inch or so on grassy and elevated surfaces. The vast majority of the city and suburban primary and secondary roads will just be wet. The good news is that behind this departing system, the clouds will finally begin to move out and we will likely see some sun before it sets tomorrow afternoon. The remainder of the forecast is dry and cool. 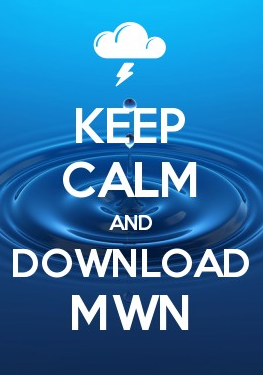 Details can be found on the MWN Forecast page. We'll provide updates via Facebook and Twitter as needed throughout the event (links below).